Tom Dixon is making it official with Milan. After skipping 2018’s Salone del Mobile, the British designer is doubling down on his presence in the city with a permanent location in the form of restaurant and showroom concept The Manzoni, opening in May after its Design Week preview. Conventional, it certainly is not. Upon entering the space, a roughly cut granite bar sets the tone for a typically Dixon experience. Moving inwards, a procession of moulded foam and black lacquer FAT chairs, cork dining tables and lave stone tiles define the pale grey room, which is lit overhead by OPAL, a glowworm-like string of translucent globes. 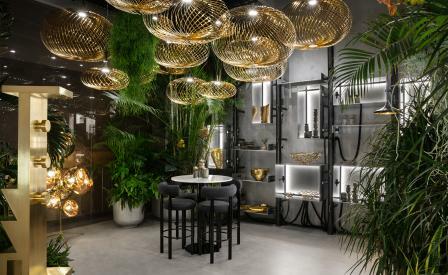 The narrow dining hall then empties out into the plant-filled Jungle room and small private courtyard, scattered with green marble Primavera tables and all-new SPRING lamps, made of twisted strips of reflective brass.